I wrote the piece below in May of 2007. In light of Adam Wainwright's recent elbow problems, I just put together a new piece, with new and better video, that discusses in greater detail Adam Wainwright's Inverted W and the Inverted W in general. 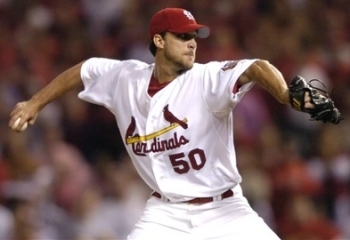 Recently, Adam Wainwright has started having problems. It has also come out that he is experiencing Tendonitis in several places in his pitching arm. Given that he is experiencing both control problems and a drop in his velocity, I believe that he is experiencing both elbow and shoulder problems. Let's go through some frames from a clip of him pitching and see if we can identify the root cause of his problems. In Frame 1 above, Adam Wainwright has the ball at his Pitching Arm Side (aka PAS) hip and is starting to swing his Pitching Arm back toward Second Base. In Frame 3 above, Adam Wainwright has swung his Pitching Arm back toward Second Base and is just starting to bend his PAS elbow. However, and IMO critically, his PAS elbow keeps moving upward after this frame. Although it's admittedly hard to see, which is why I missed it before, in Frame 6 above you can see Adam Wainwright's PAS arm forming a fairly pronounced "M" or Inverted W with his PAS elbow above the level of his shoulders and his PAS forearm hanging down below it. 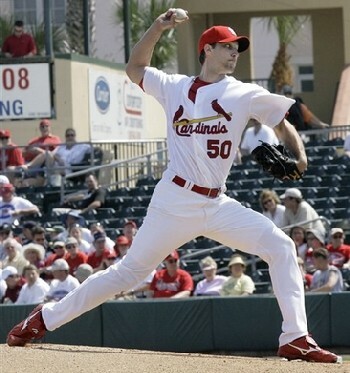 You can more clearly see what I'm talking about in the still above of Adam Wainwright. 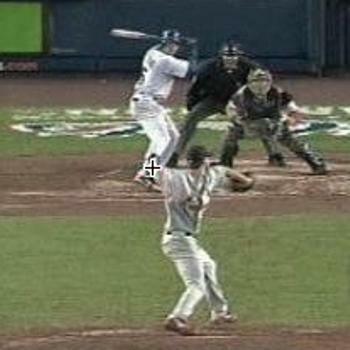 I believe that this increases the distance over which, and the force with which, his PAS upper arm will externally rotate and in place an increased load on both his elbow and shoulder. What you see in Frame 9 above is what led me to be concerned about Adam Wainwright's PAS shoulder. Notice that his PAS elbow is still above the level of his shoulders as his shoulders start to rotate. If you compare this frame with a frame of Greg Maddux at the same moment, Greg Maddux's PAS elbow will be 6 to 9 inches lower. I believe that is a very significant difference. Frame 9 also suggests that Adam Wainwright's timing isn't quite right. This, combined with what seems to be a drop in his velocity, makes me worried about his Labrum. 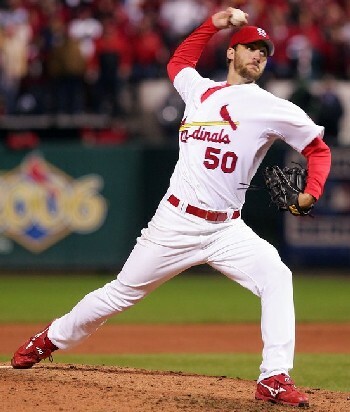 You can see this more clearly in the photo above of Adam Wainwright. You can see the same thing in the photo above of Adam Wainwright, which was taken at the same moment in time but from a slightly different angle.